It’s been a bit of a tough year for California cherries. We’ve had a warm winter and that shortened the season tremendously. This means the fruit didn’t have a chance to enjoy the necessary winter dormant period they need to flourish. I’ve seen reports that estimate growers produced far less than half the amount they grew last year, so that means an earlier lean supply and higher prices. In consolation, the cherries I’ve bought have been really delicious. Tremendously juicy eaten out of hand, I also made a lot of compote in my desire to extend their presence. One of the beneficiaries of my compote is this Cherry Almond Buckle. 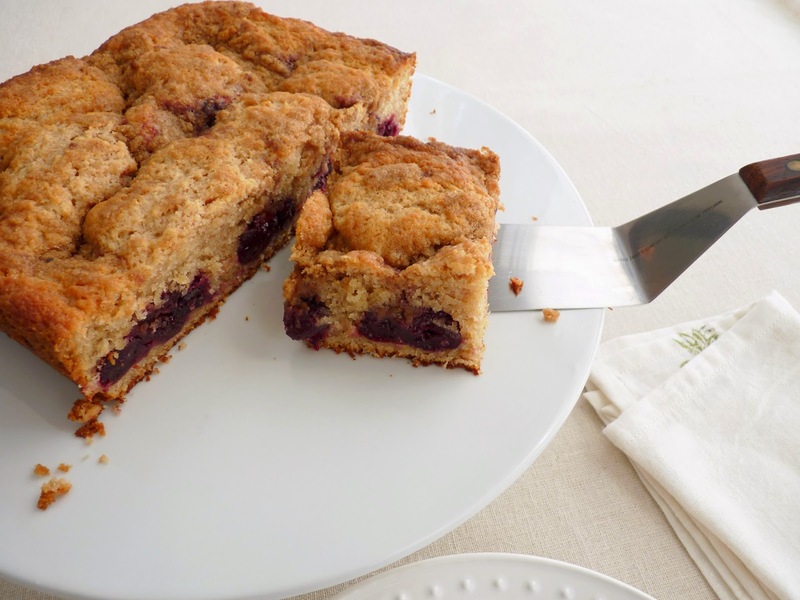 A buckle is a simple cake made with fruit and a streusel topping, like a crumb coffee cake with fruit. I added some ground toasted almonds and almond extract for flavor and a slight texture. 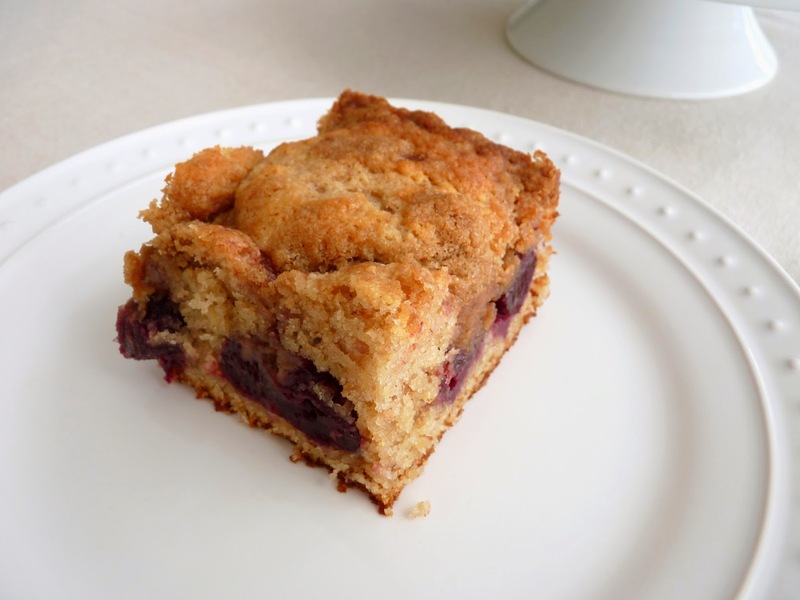 The cherries and streusel definitely bring a sense of pure luxury to it. The cake makes a nice dessert served with a dollop of whipped cream or a scoop of vanilla ice cream. It also serves well for a fun brunch along with a good strong cup of your favorite coffee. Much appreciation to all the farmers and let's all keep our fingers crossed for a more productive 2015 California cherry season. - I prepared the cherries ahead to let the flavors have a chance to harmonize. They will keep in an airtight container in your refrigerator for about a week. - Drain off the syrup before placing small pockets of the cherries in the cake batter (I placed a cluster of 3 at a time). The cherries should still be moist but you don’t want the cake batter to get soupy. Use the drained syrup and any extra cherries to flavor oatmeal or yogurt. - To toast almonds, place them in a single layer on a baking sheet in a 350 degree F oven for about 10 minutes. For the cherries, stem and pit them and place in a saucepan. Add the sugar, water, orange zest and cinnamon and simmer, stirring occasionally, until the fruit begins to soften and the juices are flowing. Taste and adjust for sugar. Combine the cornstarch with 1 1/2 teaspoons of water until there are no lumps and add to the cherries. Cook, stirring continuously, for about 3 – 4 minutes until the juices have thickened a bit. Take off the heat and add the lemon juice and vanilla. Cool completely. Place in an airtight container and chill until ready to use. For streusel, mix together flour, brown sugar, cinnamon and salt. Cut the butter into 1/2” pieces, add to the flour mixture and toss to coat. Use your fingers to flatten the butter until you have a moist clumpy mixture with some small pieces of butter still in tact. Chill until ready to use. When ready to make the cake, preheat oven to 350 degrees F. Lightly grease an 8” x 8” baking dish and line the bottom with parchment paper, leaving a short overhang on two sides. Place the flour, toasted almonds, baking powder, salt and cinnamon in the bowl of a food processor. Process until the almonds are finely ground. Pour into a bowl and set aside. Beat the butter and sugar until light and creamy, about 3 to 4 minutes. Scrape down the bowl. Add eggs one at a time and blend thoroughly. Add vanilla and almond extracts and combine. Add the dry ingredients in thirds, alternating with half the sour cream, beginning and ending with the dry ingredients. Scrape down bowl halfway through. Just before it looks completely mixed, pull it off the mixer and finish combining by hand with a rubber spatula to avoid over mixing. Pour the cake batter into the prepared pan and smooth out evenly. Draining off the juices, place teaspoons of cherries every couple of inches over the surface, pushing the fruit down into the cake batter. Set aside and reserve any remaining compote for another use. Sprinkle the streusel evenly over the top. Bake until a tester inserted into the cake come out clean, about 35 - 40 minutes. Cool for 10 minutes. Gently lift the cake out using the parchment overhang. Cool completely. Gently remove the parchment and place on a platter to serve. In pastry school, you spend a lot of time learning how to master the basics for lots and lots of classic pastries and desserts. There is a strong French influence for obvious reasons but there’s also a nod to American, Italian and Eastern European classics. The emphasis is on understanding how ingredients work together and how to coax the most flavor out of a multitude of various combinations of flour, butter, sugar, salt, eggs, cream, etc. If you get through your program with your nerves still in tact and pursue good internships and jobs under talented chefs, you can go on to develop some of your own ideas for fun and pleasure. It’s a long haul but incredibly interesting if you can keep your wits about you in a very exacting and demanding environment. 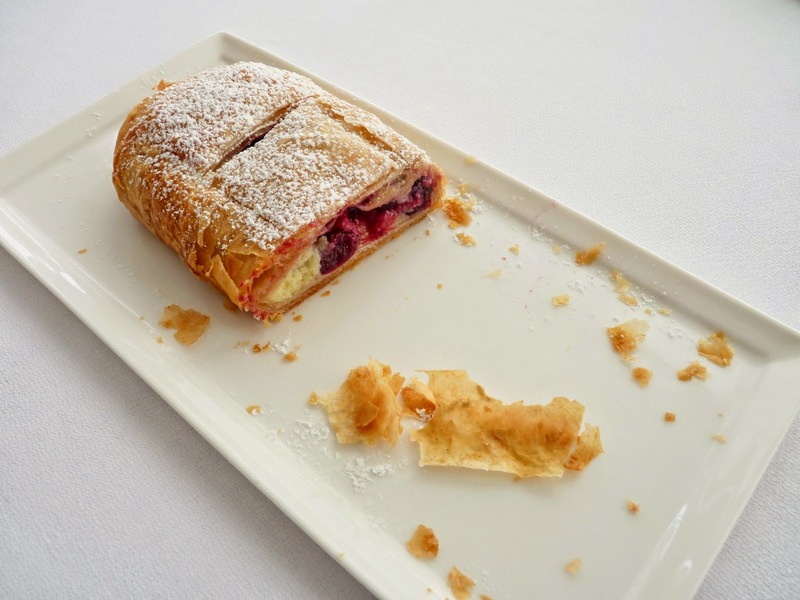 A strudel is a roll of layered pastry usually filled with apples that comes to us from 18th century Vienna. It can be made with puff pastry but is traditionally made with a dough of a simple mixture of flour, water, oil and salt that's rolled out and stretched on a floured tablecloth until it’s ultra thin. We made this in pastry school and it was divine. But I must say it took patience and a couple of us to get the job done. When I wrote my cookbook, my goal was to take some of the world’s great pastry traditions and make them new again by incorporating fresh ingredients and juxtaposing elements from different cultures. I love what happens when you take advantage of all the world has to offer and I’ve taken that approach again here today. I’ve chosen a simpler path for this strudel by using phyllo. It's filled with a pastry cream thickened with semolina and fresh cherries simmered with cinnamon and orange zest and a touch of balsamic. Phyllo is a Greek term that translates as “leaf” and is also used for Middle Eastern pastries. Semolina is an ingredient in puddings and desserts throughout Northern, Central and Eastern Europe, the Mediterranean, the Middle East and Northern Africa. Since it’s also used to make pasta, it can easily be purchased in most bulk food groceries. 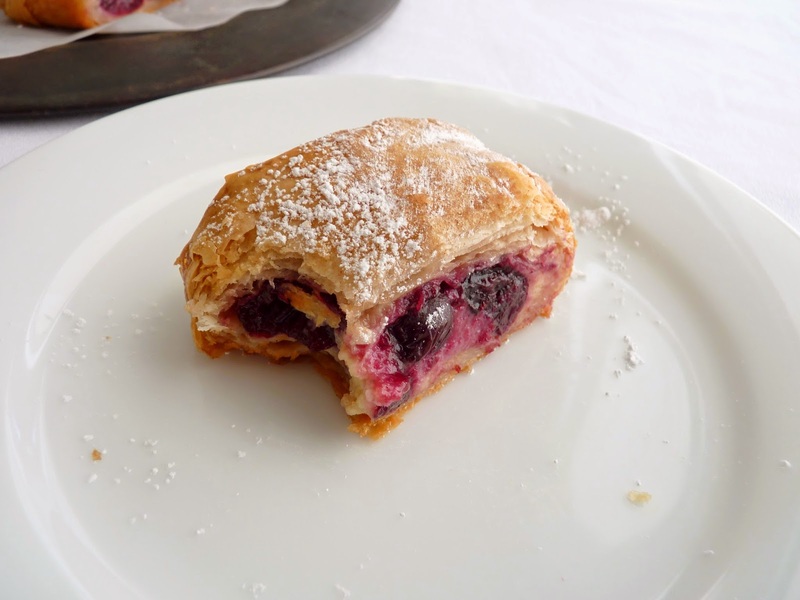 In this wonderful co-mingling of cultures, the result is an ultra crisp and creamy pastry that is full of the season’s most delicious cherries, a whirlwind tour of just about every corner of the world. - I staged this over a few days, preparing the cherries 3 days ahead (the longer they sit, the better the flavors have a chance to meld and mellow and the better they taste). I made the cream a day ahead and assembled and baked the strudel the third day. - If you can’t find semolina for the cream, use 2 tablespoons flour or 1 tablespoon cornstarch. - When you’re ready to use the pastry cream, don’t stir it more than once or twice. Over stirring will cause the starch cells to break down and rupture and it will be runny. - Butter is what makes this pastry flavorful and crisp but too much can make it greasy. 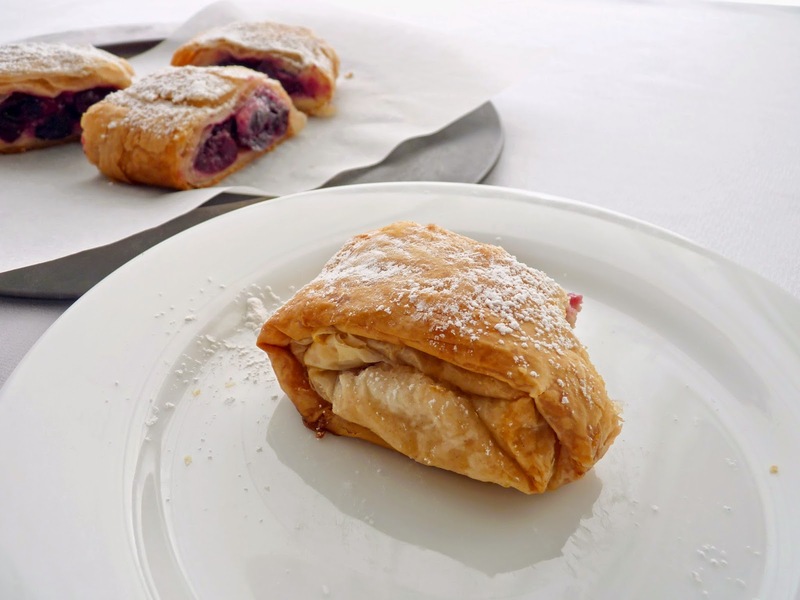 Brush each sheet of phyllo with a very thin coating of butter using a pastry brush, then brush the finished strudels for browning just before placing in the oven. - Drain off the syrup when placing the cherries on top of the cream. Use it to flavor drinks, oatmeal or yogurt. - The cookie crumbs are there to absorb any excess moisture. Use plain shortbread or almonds cookies and make fine crumbs in your food processor. Or use the more traditional bread crumbs. 1) Phyllo is usually found in the frozen food section of your market. Let it thaw at least 24 hours in your refrigerator without opening the package. Trying to hurry the thawing process at room temperature will result in phyllo that has too much moisture and will be gummy. Also, if you try to work with it when it’s too cold, it will crack. Phyllo thawed in the package will keep in your refrigerator for a few days. 2) Have all your ingredients ready before you open the phyllo packaging. Set up your work area so your phyllo, melted butter and fillings are in close proximity. 3) Remove the phyllo from the packaging and unfold it on a clean dry towel. Cover it immediately with the protective wrapping that comes in the package and then top that with another clean dry towel. The sheets are very thin and they will dry out and become brittle quickly if they make contact with air even for just a minute or so. So cover them completely after you remove each sheet. Although some recommend covering with a moistened towel, I find that only tends to render the phyllo a bit gummy. 4) Keep your hands dry. 5) Don’t worry if a sheet tears. Just patch it with the piece that broke off. It doesn’t matter much because the sheets are layered. 6) Remove the 12 sheets needed for this recipe and then immediately re-wrap any unused phyllo tightly in the same protective packaging it comes with and refrigerate immediately. It will keep for a few days. - Slashing the top of each roll before baking helps to let steam escape and also makes it easier to cut and serve without shattering the crispy pastry. - This pastry is best enjoyed when eaten the same day. 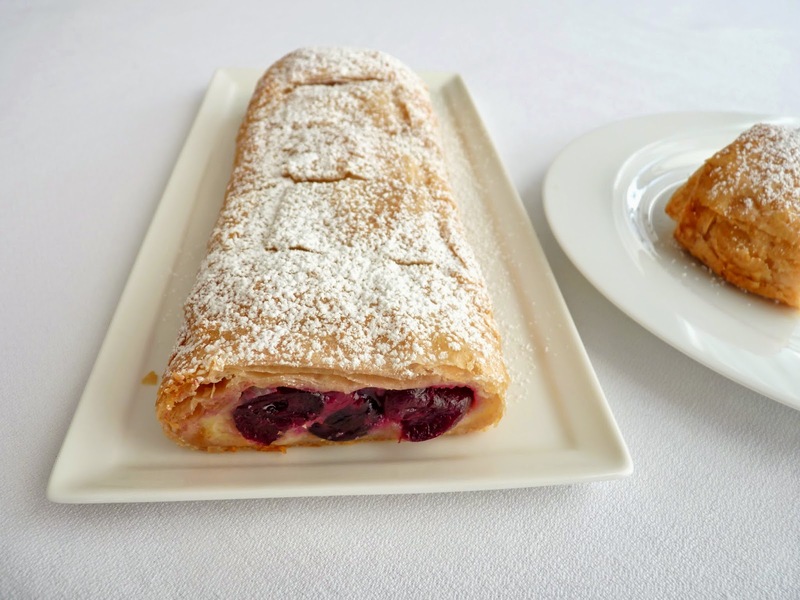 - If you’d like to experiment with the more traditional strudel dough, here’s a recipe and instructions for Austrian Apple Strudel. For the cherries, stem and pit them and place in a saucepan. Add the sugar, water, cinnamon and orange zest and simmer, stirring occasionally, until the fruit is beginning to soften and the juices are flowing. Taste and adjust for sugar. Combine the cornstarch with 1 tablespoon of water until there are no lumps and add to the cherries. Cook, stirring continuously, for about 3 – 4 minutes until the juices have thickened a bit. Take off the heat and add the lemon juice, vanilla and balsamic. Cool. Place in an airtight container and chill until ready to use. For the pastry cream, combine milk and lemon zest in a saucepan and bring to a simmer. Whisk together egg yolks, sugar and semolina until thoroughly blended and lightened in color. Add about a third of the hot milk to the yolk mixture, whisking constantly to avoiding scrambling the eggs. Add the remaining milk to the yolk mixture and whisk thoroughly. Pour the mixture back into the saucepan and cook on medium heat, stirring constantly until thickened, about 3 –4 minutes. Take off the heat and add vanilla. Cut the butter into small pieces and add to the custard, whisking together to blend. Pour into a bowl, press a piece of plastic into the surface and set aside to cool. Chill until ready to use. When ready to bake, preheat oven to 350 degrees F. Line a baking sheet with parchment or a silpat. Melt the butter and place near your work area along with a pastry brush. Combine 2 T sugar with a pinch of cinnamon and place nearby. 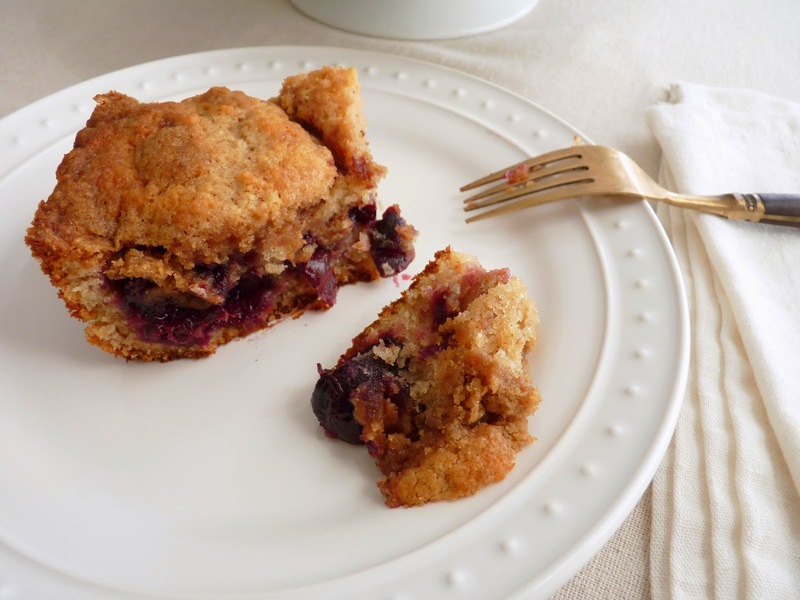 Place cookie crumbs, pastry cream and cherries nearby. Take the phyllo dough from the package and place it on top of a dry towel on a clean dry work surface. Unfold it carefully and immediately cover it with the protective sheet that comes in the package and then top that with another dry towel. Make sure the entire surface of all the sheets is covered so that none of the phyllo is exposed to the air. Fold back the towel on top of the phyllo and remove one sheet and place in your work area. Immediately cover the stack of phyllo again so that no sheets are exposed to the air. Using a pastry brush, lightly coat the phyllo sheet with a thin layer of butter. Repeat this process with 5 additional phyllo sheets until there are 6 layers of phyllo, finishing the top layer with a light brush of butter. Sprinkle half the cookie crumbs evenly over the phyllo along with half the cinnamon sugar. Dollop half the pastry cream in a row along the short end, leaving a 2” border at the bottom and the sides of the phyllo. Using a slotted spoon to drain, place half the cherries on top of the cream in a neat 2 1/2” – 3” wide pile. Fold in the long sides of the pastry and then the bottom and roll over once. Brush the top sides of the phyllo that have been folded up and over with butter. Slowly and carefully roll the pastry up to enclose the filling. Brush the edge with butter to seal. It will measure about 11” x 3”. Place on the baking sheet seam side down and brush the top with butter. Repeat this process for the second roll. Using a serrated knife, cut 5 slashes on the top of each roll. Bake until the strudels are golden brown, about 25 – 30 minutes, rotating the baking sheet halfway through. Remove to a wire rack to cool. Dust with powdered sugar and serve. America's love affair with chocolate chip, oatmeal and peanut butter cookies is undeniable. But leave it to the Girl Scouts to develop one of our nation's other most distinctive and beloved cookies, Samoas. Added to their repertoire in 1976, Samoas are produced by Keebler and have become their second best-selling cookie after Thin Mints. Samoas are composed of a base of vanilla cookie topped with caramel and coconut and drizzled with chocolate. There are lots of good recipes out there to recreate Samoas in your own kitchen. But I decided to take it to another medium. I've been getting back into making lots of ice cream lately so this seemed like a worthy project. And wow, am I glad I made this happen. This is a super ice cream. I begin with a basic coconut ice cream made with coconut steeped in coconut milk and cream. It's not a custard base, which means there are no eggs for added fat so I include some cornstarch to impede the formation of ice crystals and combat iciness. There's an easy brown sugar caramel swirled in as well as bites of vanilla shortbread. Last but surely not least, there's a drizzle of chocolate. I love how this all works so beautifully together. If you're a Samoas aficionado, you will most certainly enjoy this format. 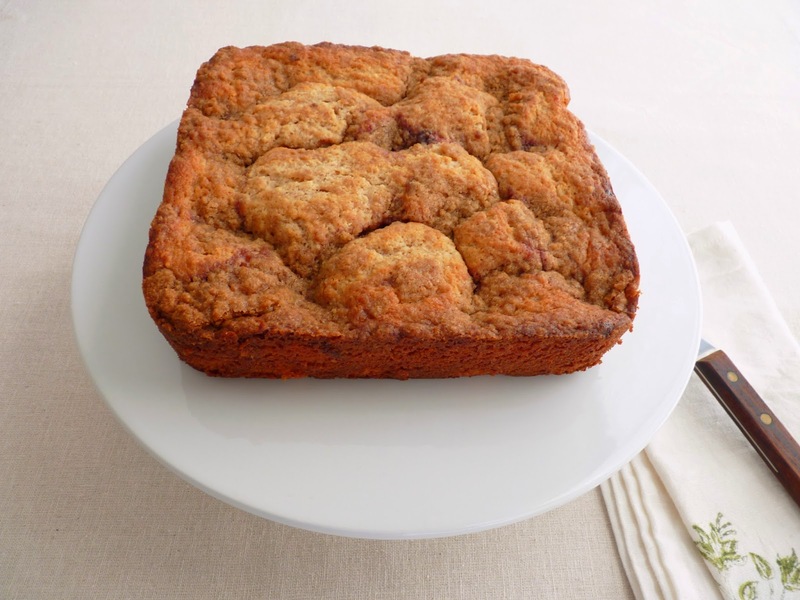 It's a great combination of luscious flavors with a balanced sweetness and a bit of texture. Just enough to get you through until the next Girl Scout cookie season. - I use Thai Kitchen coconut milk because it has a consistent quality. - I really like butter cookies in this recipe (I used my Plain Jane Cookies from my cookbook) but you can use your favorite vanilla sugar cookie if you like. Chop them into bite-sized pieces until you have about 3/4 cup or however much suits your fancy. - The corn syrup in the chocolate drizzle is there for viscosity and shine. Omit it if you prefer. - Because homemade ice cream doesn't contain any commercial emulsifiers, it's important to let it sit for 10 - 15 minutes to soften before scooping. - If you're crazy for Thin Mint Girl Scout Cookies, try this Mint Chocolate Ice Cream. Place 1/4 cup heavy cream in a small bowl and set aside. Place the remaining cream, coconut milk, shredded coconut, sugar and a pinch of salt in a saucepan over medium-low heat until mixture begins to steam, stirring to combine. Blend cornstarch with reserved 1/4 cup cream until there are no lumps. Add to the hot coconut milk mixture and cook, stirring constantly, until it just begins to come to a boil. Lower the heat and stir until thickened, about 4 - 5 minutes. Take off the heat and add vanilla and lemon juice. Taste and adjust for salt. Pour into an airtight container and cool completely, then cover and chill thoroughly, preferably overnight. For the caramel, place the brown sugar and cream in a saucepan over medium-low heat and whisk to combine. Bring to a slow boil for a minute or so until the sugar is fully dissolved and the mixture is smooth, whisking constantly. Take off the heat and add vanilla and salt, to taste. Pour into a container, cover and chill until ready to use. Freeze the ice cream according to your machine's directions. Fold in the chopped cookies pieces until evenly distributed. 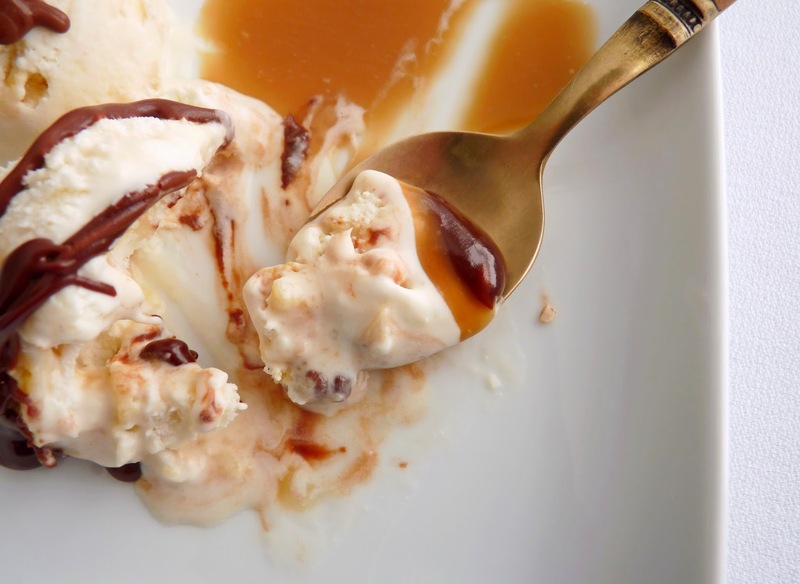 Pour about a third of the ice cream into an airtight container then dollop about a third of the caramel. Repeat with another layer of ice cream and caramel and then finish with remaining ice cream. Reserve the remaining caramel for garnish. 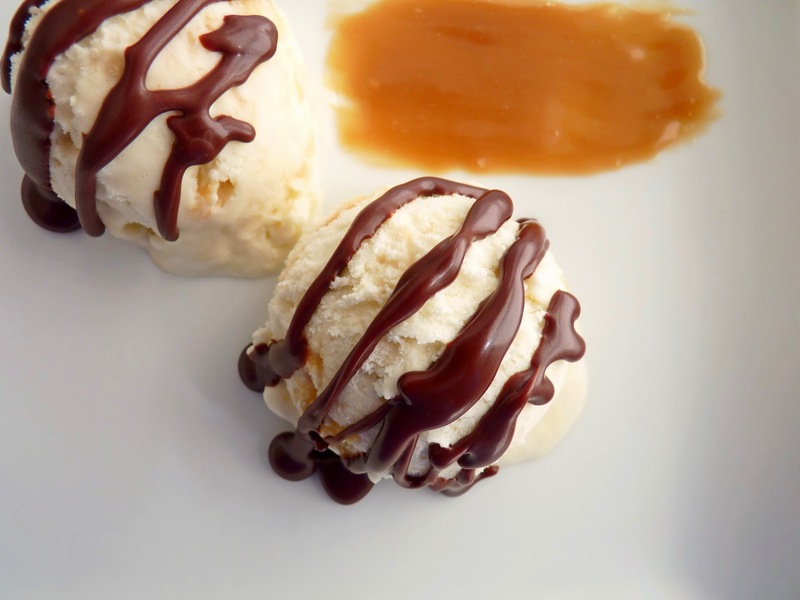 Using a knife or a skewer, draw a couple of figure 8s in the ice cream to swirl the caramel. Press a piece of plastic wrap into the surface, cover and place in your freezer to firm up. For the chocolate drizzle, finely chop the chocolate and place in a heatproof bowl. Warm the cream and corn syrup until it just begins to come to a boil. Pour over chocolate and let it sit for a minute to absorb the heat. Stir slowly until smooth. To serve, remove the ice cream from the freezer and let it rest for about 10 - 15 minutes to soften. 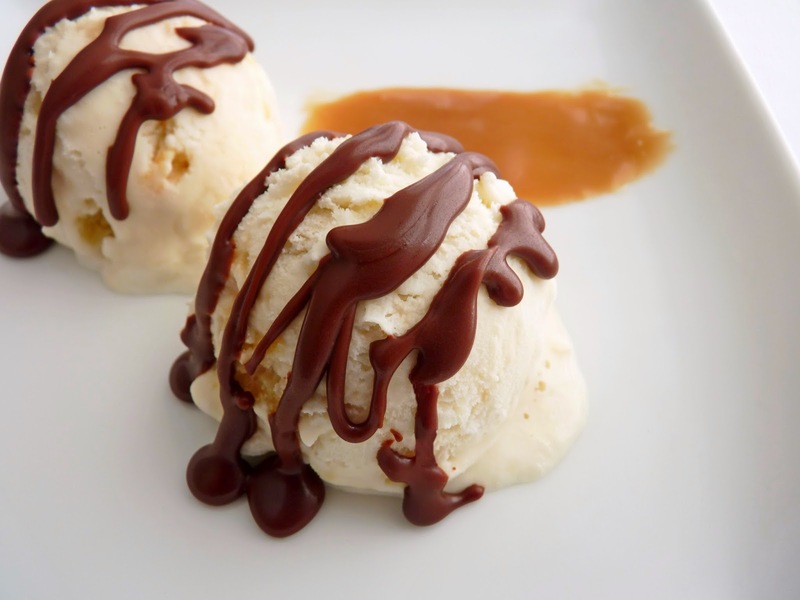 Scoop into bowls and drizzle with chocolate and extra caramel. 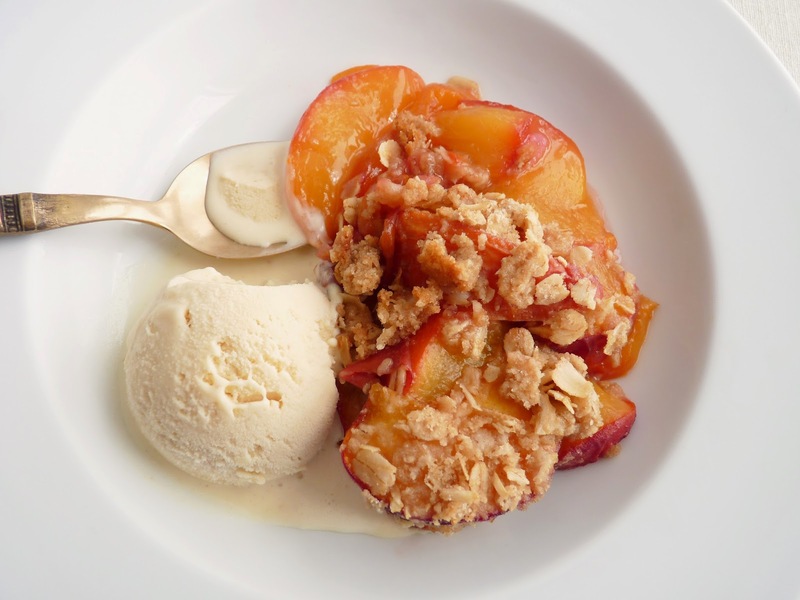 When you're busy in the kitchen and there's a lot of other stuff going on, sometimes the wisest move can be to fall back on an easy and beloved dessert, something very basic but truly satisfying like a fresh fruit crisp. 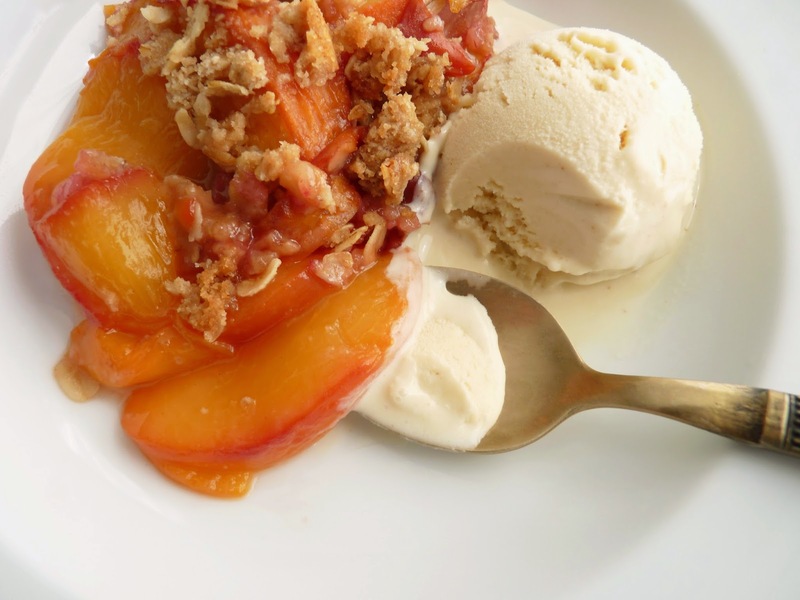 With peaches nearing the height of their season, what better way to celebrate their gorgeous and flavorful beauty than a simple spoon dessert? Among the cobblers, buckles, slumps and brown bettys, crisps are probably the most familiar. They are quintessentially American, dating all the way back to the early settlers. I remember being introduced to Apple Crisp as a kid in my school cafeteria. The star is always the fruit but the crisp and chewy topping most definitely puts it over the top. I use just enough sugar to sweeten the dessert but not so much that it masks the lovely freshness of the peaches. I do love recipes that challenge my skills and desserts with interesting and unusual components. But perhaps my first love is rustic pastries that really showcase the beauty of a few simple ingredients. 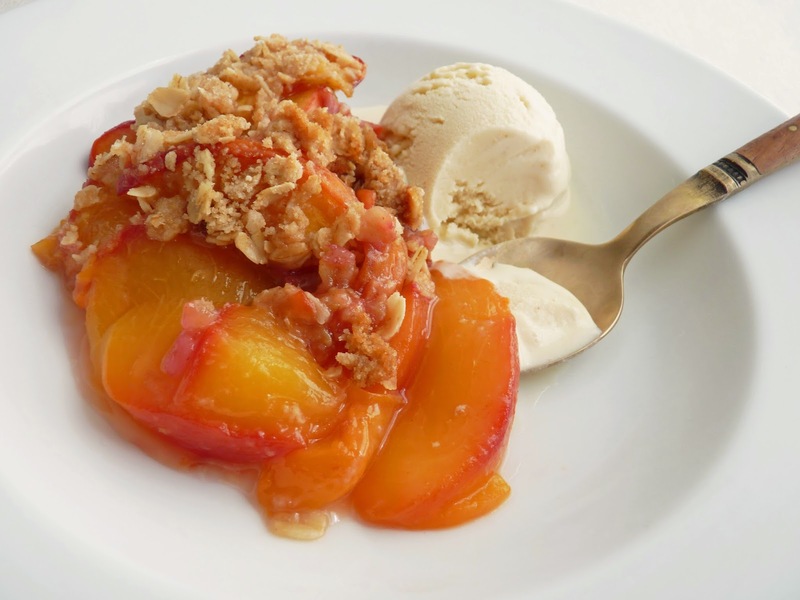 Although this Peach Crisp appears to be nothing fancy, it's a super indulgence when you feel you just can't get enough of all the great fruit in our markets right now. Served with vanilla or caramel ice cream, it's a supreme summer memory. - Peaches should be ripe but firm. - Taste your fruit to gauge how sweet it is. Add sugar to taste. Also keep in mind that the topping adds sweetness as well. - For individual servings, bake in six 4" ramekins. - Also perfect right now is shortcake. I'm talking Almond Shortcake with fresh berries! - For lots of ideas for summer fruit pastries and desserts, see my Pinterest page. Preheat oven to 375 degrees F. Have at the ready an 8" x 8" glass baking dish. Whisk together the oatmeal, flour, both sugars, cinnamon and salt. Cut the butter into 1/2" pieces and toss with the oatmeal mixture, coating each piece. Work the butter in with your fingers, pinching it into smaller pieces until the mixture is combined into large and small crumbles. Chill while you prepare the fruit. Cut the peach in half and remove the pit. Cut each half into 1/2" slices and place in a bowl. Combine the sugar and cornstarch and toss with the peaches until the fruit is evenly coated. Add the lemon juice and toss. Put the fruit in the baking dish and spread into an even layer. Sprinkle the oatmeal mixture over the peaches. Bake until the topping is browned and the fruit is bubbling vigorously, about 30 minutes. Serve warm or at room temperature.